Back in July we posted a design visual of a project we were taking on in Wapping. We recently started that project and are making some great progress on it, we feel it is a particularly good project to do an update about as it illustrates what you can do, even with limited space. The customer lives in a relatively urban area in a terraced house so making the most of the space was the aim of the game for this particular build and we think Ben Chandler really pulled it off. 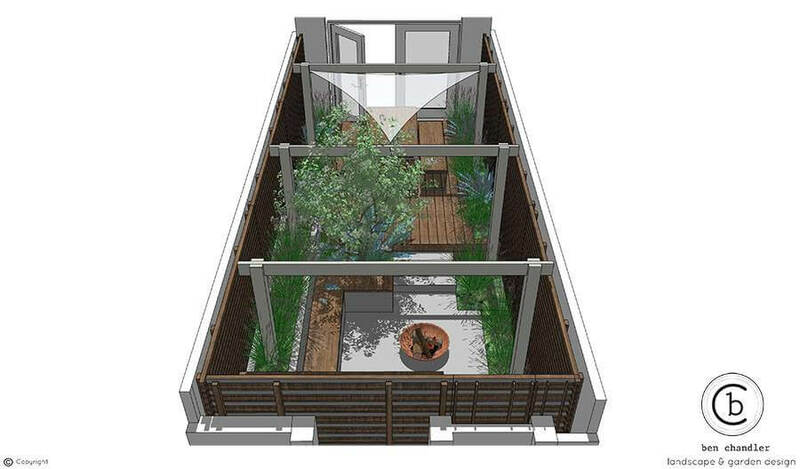 The design makes use of the length of the garden as the width is restricted by the nature of the property. 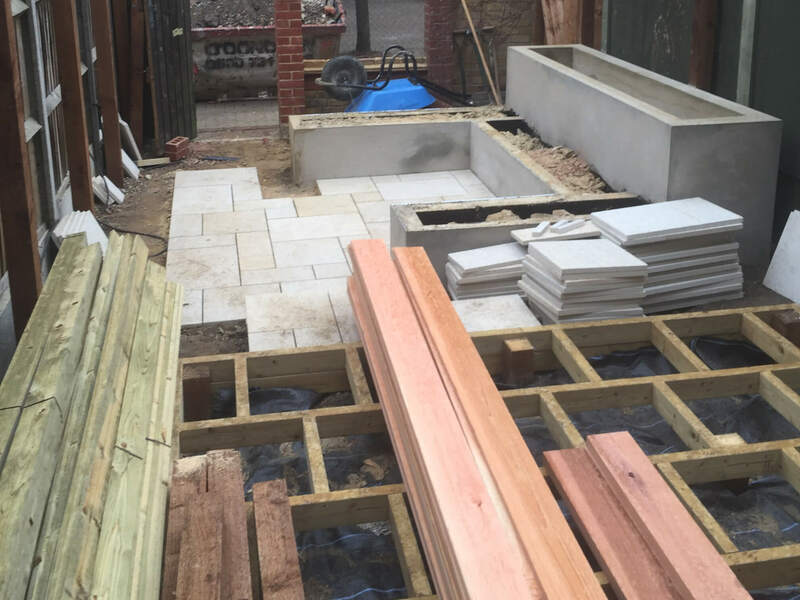 Ben has created two distinct areas of the garden for the customer, a decked area with a permanent outdoor dining and seating area which will be perfect for those warmer evenings where eating indoors just doesn’t quite cut it. The second area at the bottom of the garden features a gorgeous fire pit design with a custom built bench. What really stands out about this design is how secluded it is going to make the garden feel, notice the high fences which will block out the surrounding houses and gardens from view, creating an idyllic place to relax for our customers. The trellis overhead gives the option in the future to fill out with climbing plants to make it even more secluded. 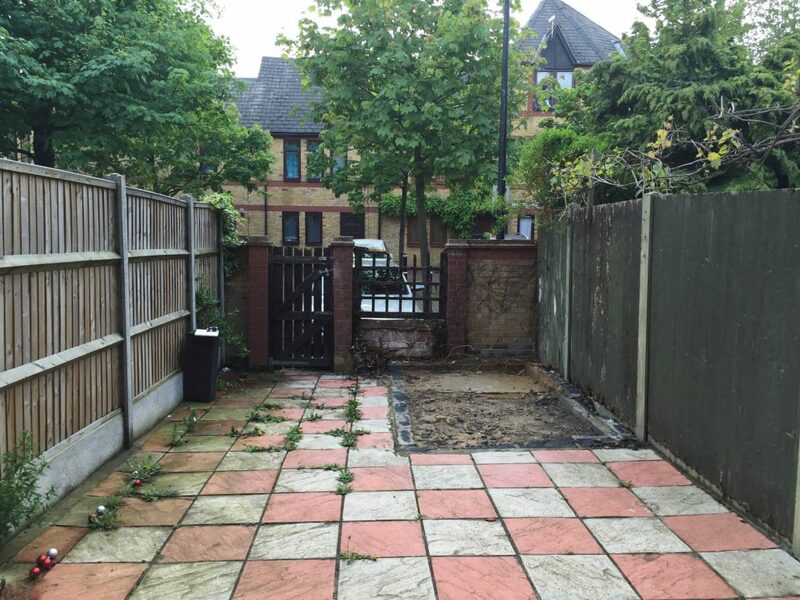 These two images show the garden before we began any work. You can see that, while the space is narrow, it is not that small when cleared, certainly enough space to create something beautiful in. 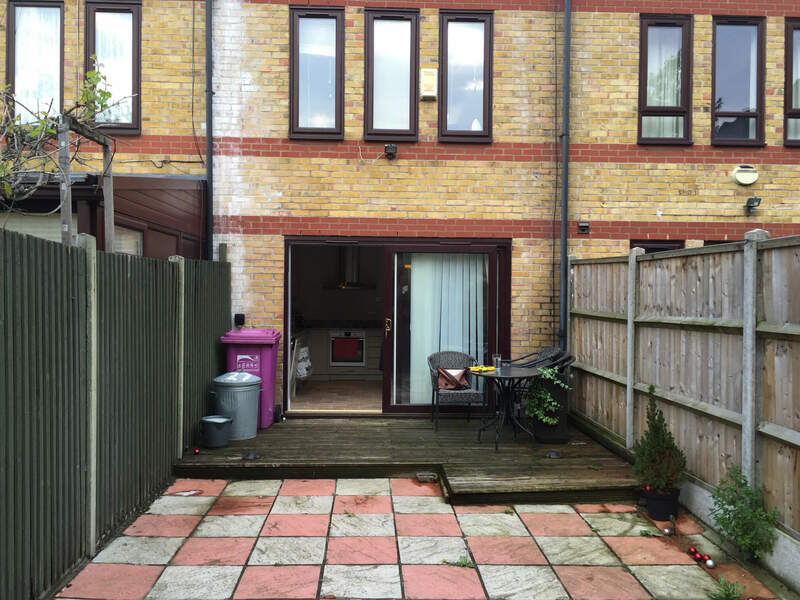 Decking is already down as you step out of the house but this is being replaced, the patio tiling is very dated and is being taken out in its entirety. We’ve laid the timber decking frame as you can see from the image above, it’s going to cover more area than their original decking, giving them more space for that outdoor eating area. We also have their paving laid down now as well as their raised flower beds which you can see as the rectangular objects in the above. This image gives a different angle of the same area, you can see here the shape of that raised bed which also becomes the backing to the bench that will be installed. 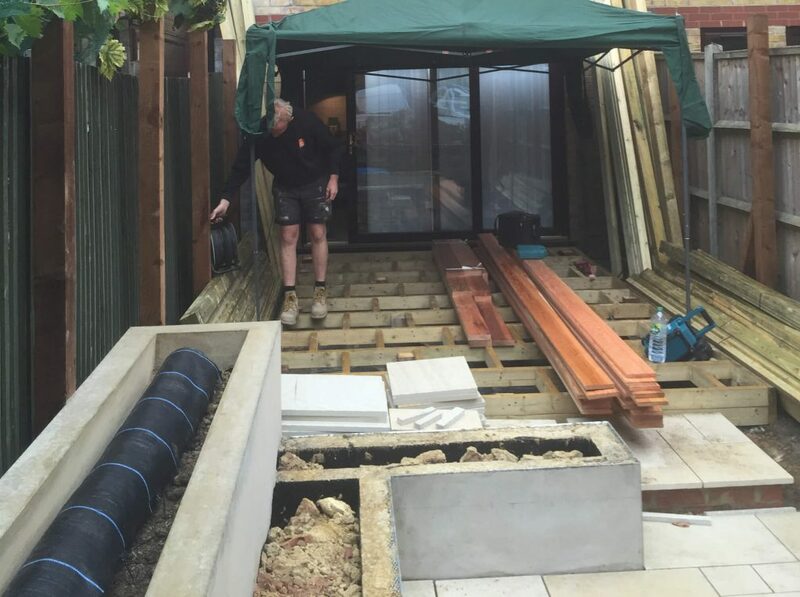 You can also see in this image the timber that will be used for the decking as well as the horizontal slatting that is to go up around the entire edge of the garden to create the fencing. All in all we are extremely pleased with how well this project is coming together and we believe this is going to make a huge difference for the customers as it will be their own little slice of heaven. We will provide another update when the project is completed!